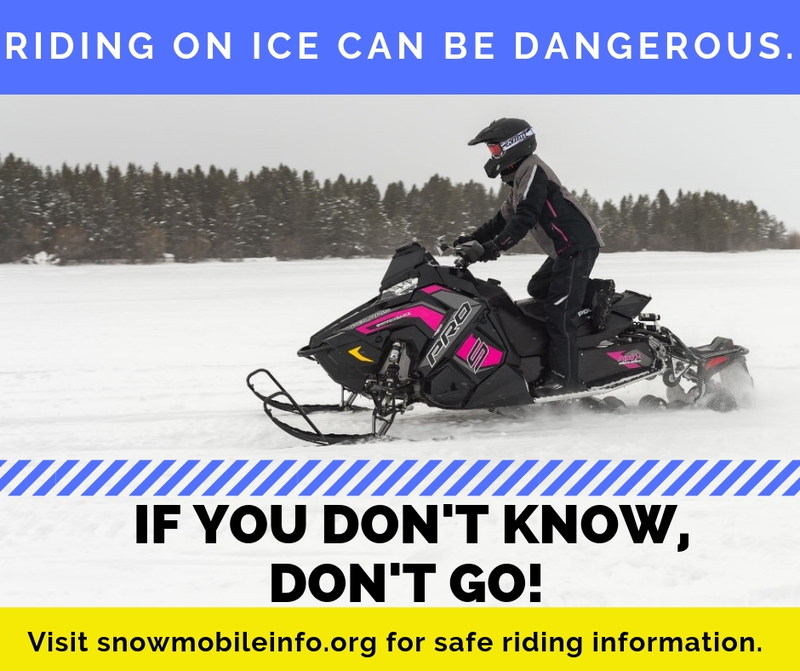 The most comprehensive collection of online and downloadable snowmobile safety education tools and training materials you’ll find anywhere. 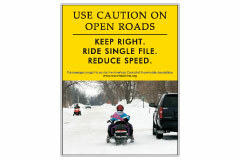 A wide range of posters, brochures, videos, clip art, manuals and websites are available to help promote and teach safe snowmobiling practices. 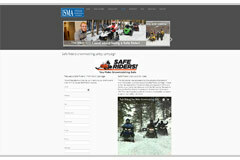 Visit this online program to learn about basic snowmobiling safety. 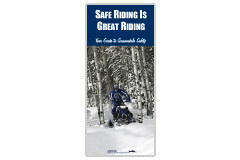 It provides detailed information covering: how to prepare for your ride, general safety, proper riding apparel and techniques, general snowmobiling rules and laws, parts on your snowmobile, basic snowmobile maintenance, how to prepare for emergencies, and dangers you should avoid. 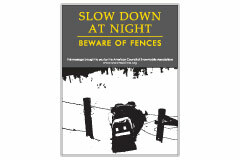 There are short quizzes at the end of each section to test your knowledge. 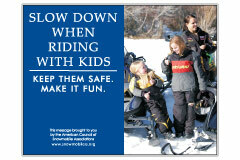 "Ice Safety" audio PSA30-second PSA about ice safety while snowmobiling from a partnership of the American Council of Snowmobile Associations (ACSA) with funding provided by the Recreational Trails Program administered by the U.S. Department of Transportation – Federal Highway Administration (FHWA). 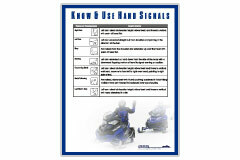 Poster displaying all of the snowmobiler hand signals. 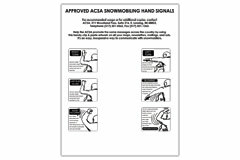 Collection of line-art drawings of various snowmobiler hand signals. 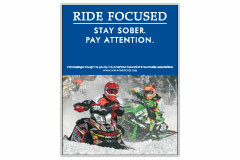 Poster to teach snowmobilers hand signals to improve snowmobiling safety. 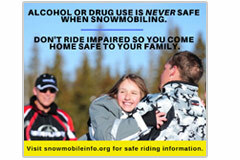 This social-media meme promotes safe snowmobiling and modeling safe snowmobiling to others. 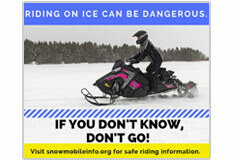 This social-media meme promotes ice safety while snowmobiling"If You Don't Know, Don't Go." 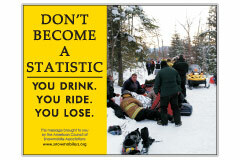 This social-media meme promotes the resources nedded to be a safe snowmobiler are available at snowmobileinfo.org. 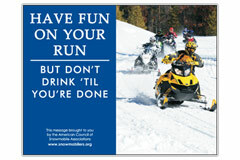 "Become a member of your state snowmobile association" 30-second PSA video. 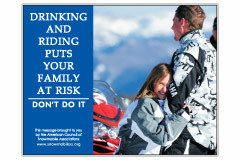 This 30-second TV PSA promotes club and association membership; club members generally become safer and more responsible riders. Please use these videos for membership recruitment. 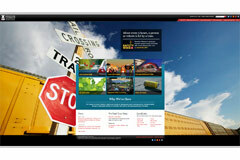 Link from your site. 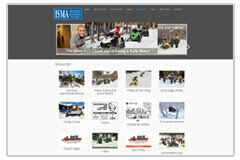 "Become a member of your state snowmobile association" 60-second PSA video. 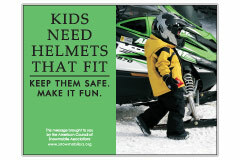 This 60-second TV PSA promotes club and association membership; club members generally become safer and more responsible riders. 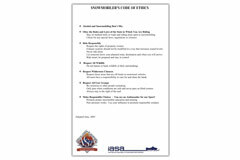 Please use these videos for membership recruitment. 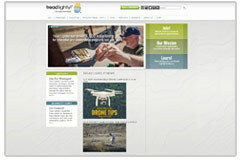 Link from your site. 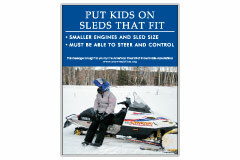 "Renting Snowmobiles Successfully: A Guide to Best Business Practices"
This manual outlines recommendations and guidelines to help snowmobile rental businesses develop proper levels of education and operational guidelines for the snowmobile rental industry. 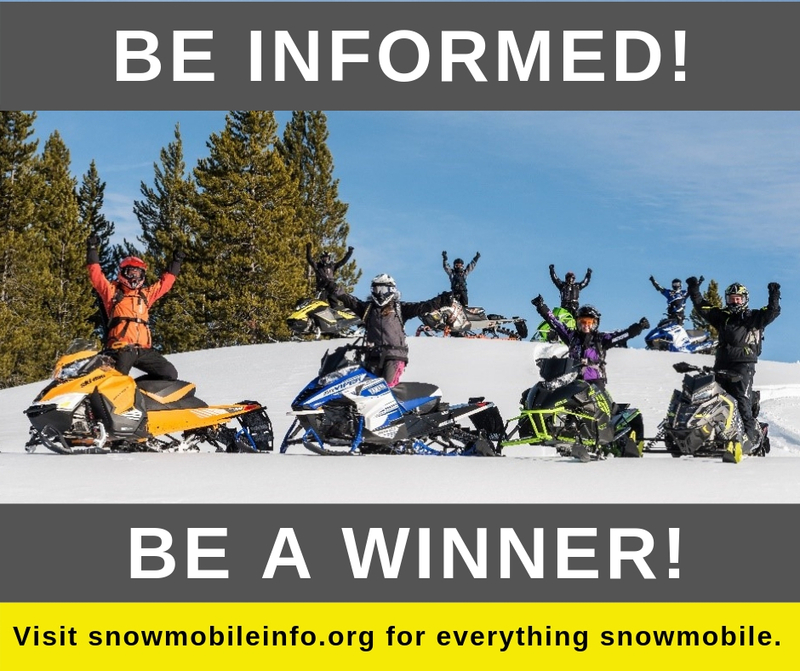 Its objectives are to promote safer, more responsible, snowmobiling behavior and to help reduce the risk of personal injury, loss of life, environmental impact, and property damage. 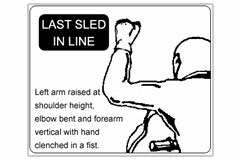 Recommendations cover personnel selection and training; customer orientation and education; rental business operations; resources for rental businesses; sample forms and educational materials to assist rental operators. 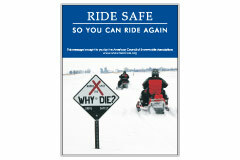 This pocket guide was adapted from the web-based Safe Riders! 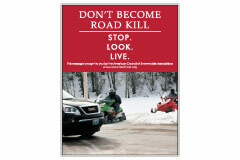 Snowmobile Safety Awareness Program to help further snowmobile safety awareness, black & white version. 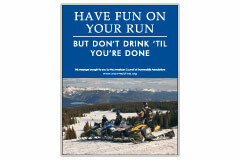 Vertical poster of the snowmobiler's code of ethics; adopt this code for safe and responsible snowmobile operation. 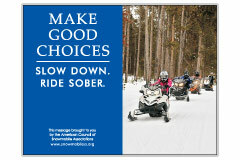 Take this 10-point pledge to be a safe and responsible snowmobiler. 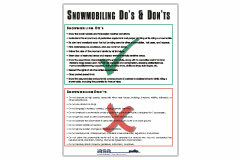 Points out good and poor practices when snowmobiling. 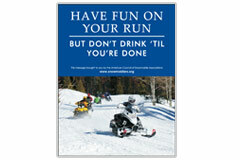 Tips about how to be a safe and responsible snowmobile rider, Safe Riders! 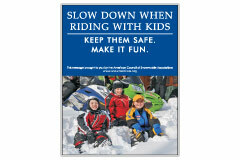 posters plus 6 coloring posters promoting safe and responsible snowmobile operation. 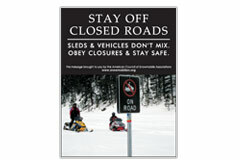 Eight downloadable public service announcement radio spots plus thirty public service announcement posters and logos promoting safe and responsible snowmobile operation. 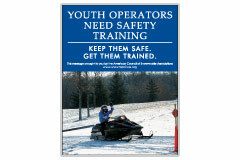 This instructional video series educates snowmobilers about the basics of snowmobile safety. 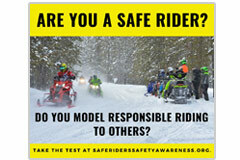 The 13-video series is the product of the Safe Riders! 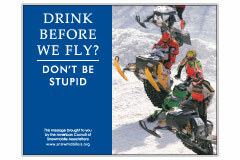 campaign initiated by ISMA and the four snowmobile manufacturers: Arctic Cat, Bombardier Recreational Products(Ski-Doo), Polaris Industries , and Yamaha Motor Corporation, USA. 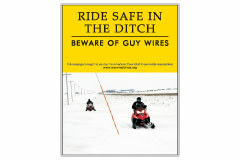 This series is a great supplement to a snowmobile safety course and is used by many safety instructors. 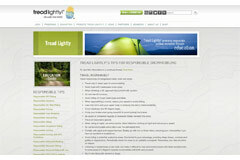 Tread Lightly! 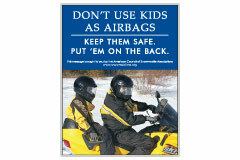 provides the snowmobile safety and ethics/responsible-use education materials. 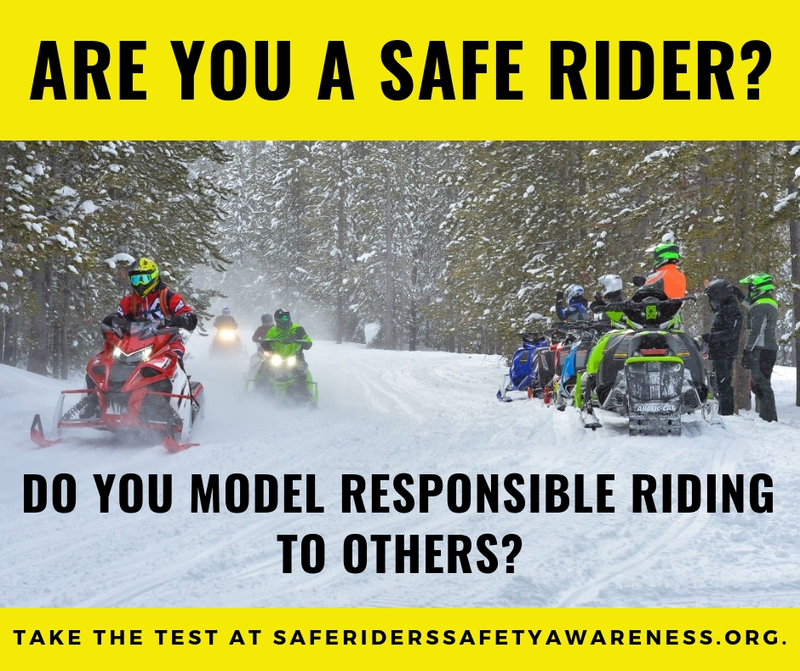 Tips about traveling responsibly, respecting the rights of others, educating yourself, avoiding sensitive areas, and how to do your part to be a responsible snowmobile rider. 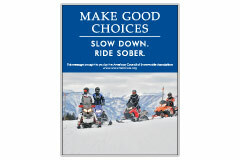 This booklet will help you prepare for an enjoyable outdoor experience on a snowmobile, and at the same time, help you to be a responsible, positive influence on nature and those around you. 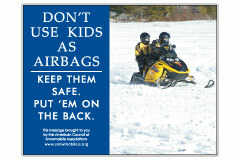 Educational exercise questions challenging students to identify items they should have in their pack to be prepared when snowmobiling. 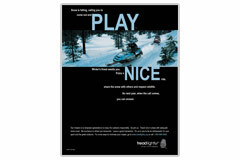 "Play Nice" poster encourages riders to share the snow with others and respect wildlife. 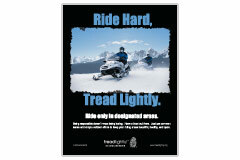 "Ride Hard" poster encourages riders to tread lightly by riding only in designated areas. 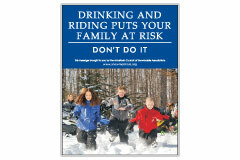 Downloadable banner encouraging travel only on adequate snow cover. 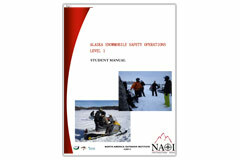 This curriculum prepares students for safe snowmobile travel on terrain ranging from trails to open fields or tundra to mountains and glaciated conditions. 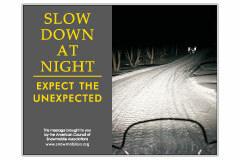 30-second PSA about snowmobile safety from the Alaska Highway Safety Office. 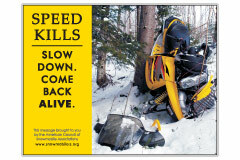 30-second PSA about snowmobile safety from Iowa DNR. 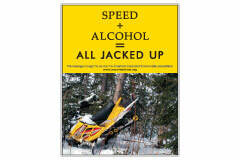 Many snowmobile crashes occur because of alcohol consumption. 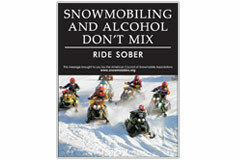 Alcohol use is also a leading cause of snowmobiling related fatalities. 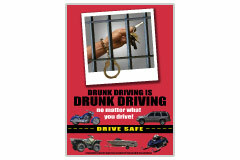 Alcohol and drugs negatively affect the body by affecting the driver's vision, equilibrium or balance and coordination, and reaction time. 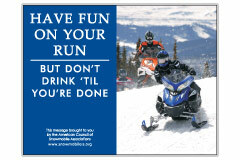 Help encourage snowmobile operators to make responsible choices by promoting that they refrain from consuming alcohol before and during all snowmobile outings. 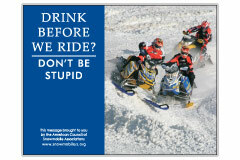 This 30-second public service announcement video reminds riders that weather conditions, terrain, and impaired judgment from alcohol can endanger even the most experienced of snowmobilers. 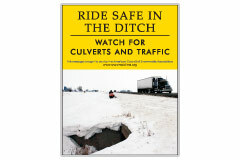 Sponsored by ACSA and the U.S. Department of Transportation FHWA, these television and radio spots are available for download through the ACSA & ISMA websites. 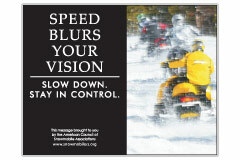 30-second PSA about impaired snowmobile riding from a partnership of the American Council of Snowmobile Associations (ACSA) with funding provided by the Recreational Trails Program administered by the U.S. Department of Transportation – Federal Highway Administration (FHWA). 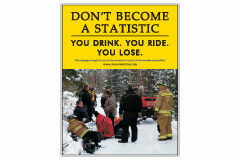 "Drunk driving is drunk drivingno matter what you drive! 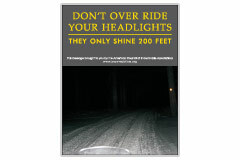 ": Drive Safe Poster. 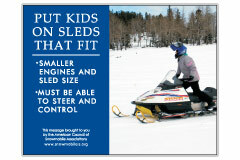 This poster is part of a snowmobile safety education tool kit developed by ACSA to bring further awareness of safe snowmobiling practices. 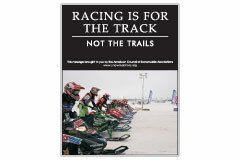 Funding was provided by the Recreational Trails Program administered by the U.S. Department of TransportationFHWA to help develop materials available in this tool kit. 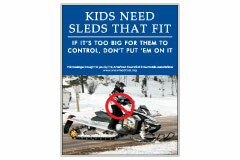 A wide range of materials are provided in recognition of the varying local priorities across the snowbelt. 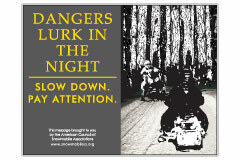 Quarter- and half-page ads (for both newspaper and magazine format publications) that feature the poster series are also available by contacting the ACSA office. 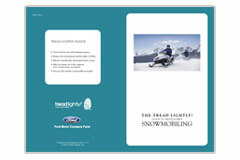 Poster Printing: For best results, the 8 1/2" x 11" posters should be printed on 65# or heavier white card stock. 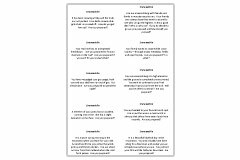 Check to ensure the printer is set to 'letter' size, that orientation is 'portrait' to match vertical poster design or 'landscape' to match horizontal poster design, and that the page scaling is set to 'Fit to Printable Area.' Also be aware that colors will be more vivid if the poster is printed directly from an electronic file versus making color copies of a poster. 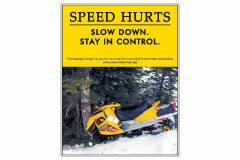 Speed is another major factor in many snowmobile crashes. 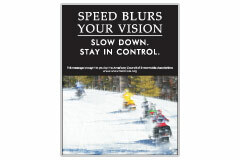 Help encourage snowmobile operators to always keep the speed of their snowmobiles slow enough to ensure they are in control and operating safely. 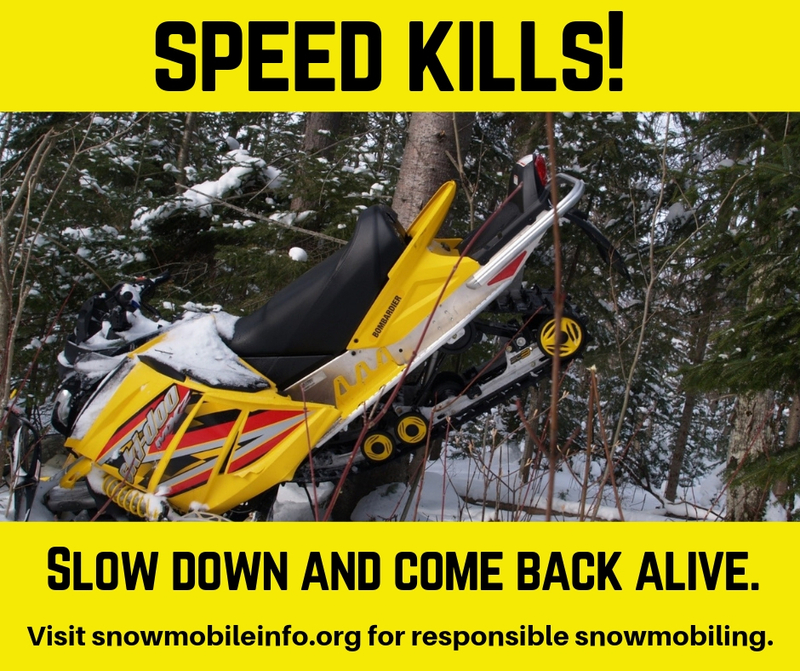 30-second PSA about excessive snowmobiling speed from a partnership of the American Council of Snowmobile Associations (ACSA) with funding provided by the Recreational Trails Program administered by the U.S. Department of Transportation – Federal Highway Administration (FHWA). 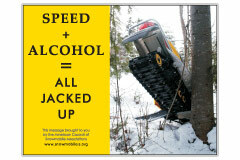 When speed and alcohol use are combined, the results can be deadly. 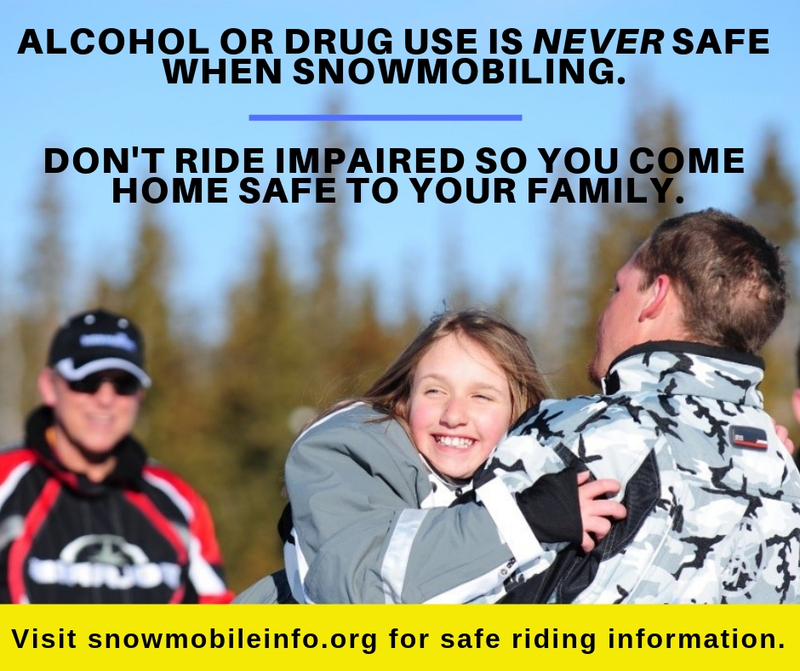 The following materials combine messages to help address these two top issues together; help encourage riders to beware of this deadly combination. Riding at night requires extra precautions. 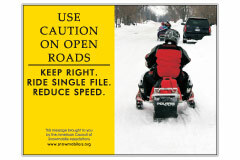 It is important to ride at slower speeds and to use caution to not override snowmobiles' headlights. 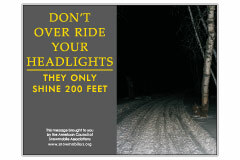 Headlights generally illuminate the path about 200-feet in front of snowmobilesso if you're driving faster than 45 to 50 mph you're likely starting to exceed the area illuminated by headlights before you can react and stop safely. Help encourage snowmobile operators to slow down at night and to be aware they can quickly override snowmobiles' headlights. 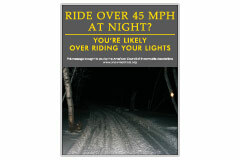 This video effectively shows the dangers of riding your snowmobile at night with over riding headlights. 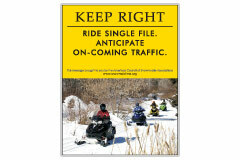 Many snowmobile trails are located alongside roadways and sometimes cross over them. 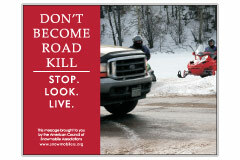 Always be aware of vehicles on the roadway, drive defensively, and come to a complete stop at all posted stop signs, as well as at unmarked road crossings. 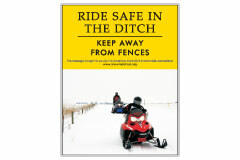 Help educate snowmobile operators to the numerous hazards they may encounter when operating along roadways, particularly within the borrow ditch. 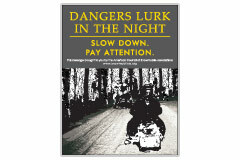 Be alert and safe near railroad tracks. 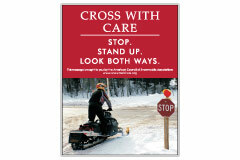 Always cross tracks at a designated crossing as close to 90 degrees as possible. 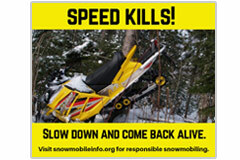 Video stressing the danger of operating snowmobiles on railroad tracks. 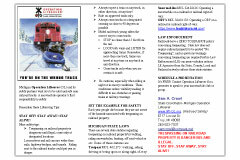 Poster displaying snowmobile versus train. 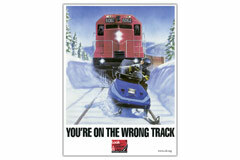 "You're on the Wrong Track"tri-fold brochure example from Michigan. 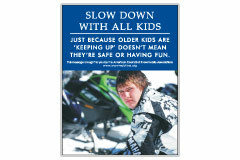 Youth are important to the future of snowmobiling, so it is important that extra precautions be taken to ensure they have safe outings that are also enjoyable so they develop a desire to continue snowmobiling as they get older. 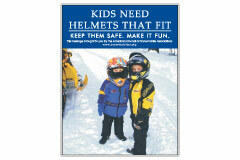 Help ensure youth operators receive proper training and that adults use appropriate precautions when riding with kids. 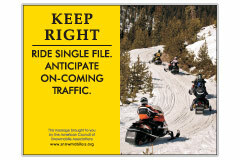 The Snowmobile Safety and Access Resources Information Center was developed and is operated by the American Council of Snowmobile Associations (ACSA) with funding provided by the Recreational Trails Program administered by the U.S. Department of Transportation – Federal Highway Administration (FHWA). 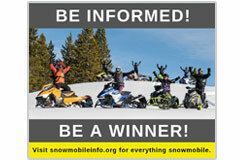 Inquiries can be sent to info@snowmobileinfo.org.